This last weekend we took Mikey 835 down to the Columbia Gorge for three days of sailing in the Pacific Sailing Championships. 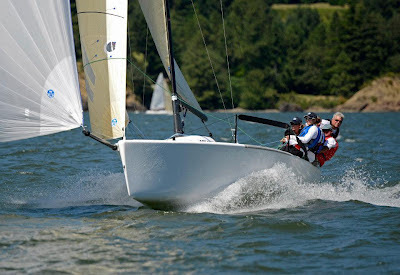 Our primary interest participating in this event was to get some time sailing the Melges 24 in serious breeze -- something that we don't get to do very often in Anacortes, and when we do it is typically in survival conditions. On Friday we practiced in rare easterly winds that diminished later in the day - this made for long upwind beats and very short downwind runs. On Saturday this easterly was a little stronger and we got in five races, each with winds in the 18-25 knot range. On Sunday we were greeted with a nice westerly that built as the day went on, getting in four races before heading back to the dock to put the boat away. 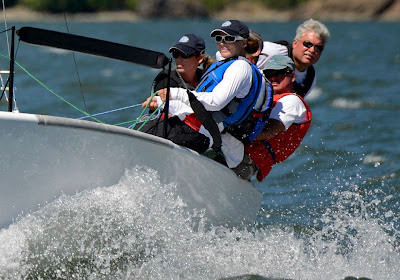 We ended up the regatta with 9 bullets and first place - a nice change from our mid-pack results at the US Nationals earlier in the year. The Columbia Gorge Racing Association put on a great event in a wonderful venue which I am sure will become a regular one on our schedule.